WH Group’s revived initial public offering shows it has learnt at least one lesson. After an attempt to sell shares two months ago ended in disaster, the Chinese pork producer has returned, cheaper and with fewer banks working on the deal. But it’s not clear why it is rushing back to market at all. Compared with the failed attempt to raise up to $6 billion in April, WH Group’s new plan looks positively austere. It will raise no more than $3 billion, with the company valued at between 11.5 and 12 times its forecast earnings for 2014, according to a person familiar with the situation. That seems reasonable against other Chinese consumer stocks. Mengniu Dairy trades at 24 times. Instead of 29 banks advising on the deal, there are now just two. WH Group’s private equity backers, which own almost half the company, are also no longer driving the listing process. The new offering will be comprised entirely of new shares rather than stock sold by insiders – removing another factor that weighed on the price IPO investors were prepared to pay. Pulling off a successful IPO would save face for China’s “chief butcher” – chairman Wan Long. He owns around 43 percent of the company along with other employees. The main reason for raising money is to cut the $7.1 billion of net debt on the business Wan built up. That’s not obviously the most financially rational thing to do. WH Group might have extracted a higher valuation if it had waited say, another year, and allowed the synergies to materialize from its acquisition of U.S. rival Smithfield last year. There’s no urgent need for cash, with operating profit comfortably covering interest payments 1.8 times over in 2013, based on numbers in its filing on July 9. The risk is that the main benefit of listing is to give WH Group’s current investors the possibility of an exit as soon as they are free to sell shares. Nonetheless, WH Group has probably done enough to get its IPO away, and lure back investors who shunned the deal first time around. Leaner is undoubtedly better. People walk into an investment luncheon by WH Group Ltd. in Hong Kong April 10, 2014. China's WH Group Ltd, the world's biggest pork company, has launched a Hong Kong initial public offering of as much as $5.3 billion in the second-largest ever IPO by a food and beverage company. Pork producer WH Group has revived plans for an initial public offering, aiming to list in Hong Kong by the end of July, according to a person familiar with the situation. The Chinese company aborted its previous attempt to float on April 29 after receiving a cool reception from investors. The private equity backed group now aims to raise between $2 billion and $3 billion at a valuation of 11.5 to 12 times its forecast earnings for 2014, the source added. WH Group previously sought to raise up to $6 billion at a valuation between 15 and 20.8 times. 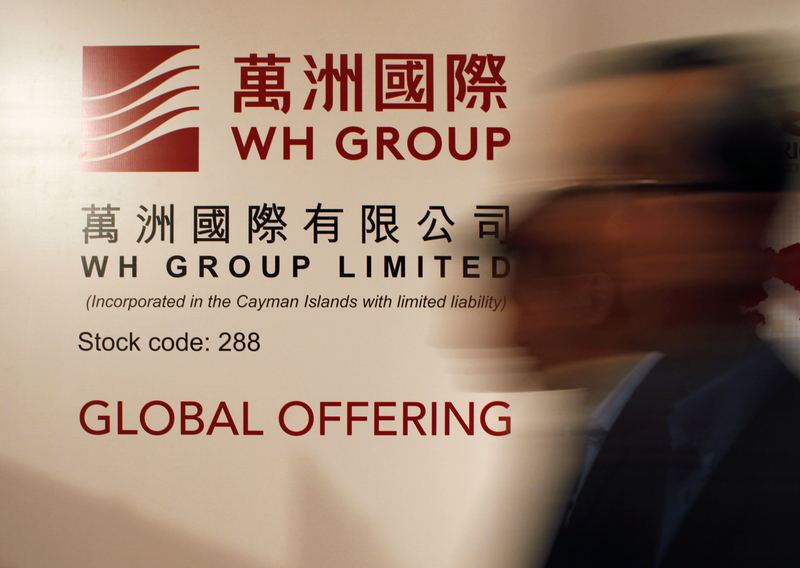 The new shares will account for 20 percent of WH Group’s post-IPO share capital. No existing shareholders will sell any stock in the offering. The proceeds will be used to pay down debt taken on in the acquisition of its U.S. business, Smithfields, for $7.1 billion in 2013. WH Group also cut the number of banks advising on the listing from 29 to 2: Morgan Stanley and Bank of China International.